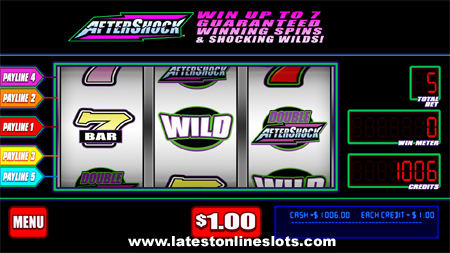 Aftershock is a new WMS 3 reel classic slot machine. It has the traditional 3 reels but comes with 5 paylines. The symbols include various colored number sevens, various bars, a Wild symbol, a Double Aftershock symbol and a Triple Aftershock symbol. So the new slot game sounds a little boring, right? Well for some, 3 reel classic slot machines are a bit boring. And because Aftershock does not have a bonus round to speak of, that might add to some online gamblers boredom also. But here’s the catch to Aftershock. It has the Aftershock or what some call a “frenzy” feature. This feature will surely add some excitement to the game. When the Aftershock or “frenzy” feature triggers after a regular spin is complete, the machine will go into a frantic frenzy. The reels will start spinning back and forth up to seven times with a guaranteed win every time the reels stop. This does not mean you will win the top jackpots as just one wild symbol could be the only winning symbol that lands on the payline. If you frequent land-based casinos and have seen the “frenzy” type slot machines, you will know exactly what the Aftershock online slot consists of. I suggest that you do give the new slot machine a try because it does have the potential to hit Wilds on all paylines. Can you imagine hitting the Aftershock feature after that happens? Play Aftershock at Slots Magic online casino today!